Most non-domesticated life on earth is in decline and about 200 species a day are going extinct due to a wide range of environmental problems. Many humans are at risk of being harmed or killed by related problems this century. All of the many problems are caused by the same thing: humans have used non-renewable energy to explode their population from 1 billion to 7 billion in 100 years, and now consume so large a share of the earth’s resources that almost all non-domesticated species are in decline. Note that I use the word “resources” here in a broad context meaning land, water, minerals, photosynthetic output, biomass, and the planet’s capacity to recycle waste products. The total quantity of resources consumed by humans equals the human population times the average consumption per person. About 75% of the world’s population are poor and do not consume much more than is required for subsistence, although they desire and are working hard to consume more. The privileged 25% are working hard to maintain and grow their level of resource consumption and the majority are unwilling to contemplate a voluntary reduction in consumption, in part because they know that if they reduce their consumption others will consume the freed resources. This dynamic makes it difficult to reduce the total human footprint by reducing per capita consumption. Therefore, any progress towards solving the problems caused by human overshoot must come from a reduction in human population. Paraphrasing Albert Bartlett, “There is no problem on earth that does not improve with fewer people”. Establishing an effective and fair global population reduction policy will be very difficult and may be impossible for many reasons, not least of which it conflicts with what our genes want to do. It may also be too late for a reduction in birth rate to prevent the worst consequences of overshoot. We can however say with certainty that a rising population will make things worse and a falling population will make things better. Therefore we should try to get the population down regardless of the prognosis. Given that population reduction is the only thing that might help our predicament, why do we not even discuss it? More to the point, why do those individuals and organizations with the best understanding of the seriousness of our predicament not speak out for population reduction? I am talking about environmental organizations, climate scientists, biologists, ecologists, deep greens, peak oilers, doomers, you name it. Almost without exception they are silent on population reduction. I see the same dynamic in activist friends and acquaintances who deeply care about the planet and who work hard on environmental and social issues but never mention population reduction, despite the fact that population reduction is the only thing that might improve long-term environmental and social issues. I understand that it may be impossible to gather enough political support, and that we might conclude that unintended consequences of population reduction policies are worse than the problems we are trying to solve. But at least we would have had the conversation and made a deliberate decision to not change course. As it stands today we are racing towards a cliff without even discussing if we should slow down or change direction. I like to think that if citizens understood that the choice was between having one child with some chance of a happy life versus having several children with no chance of a happy life, I think most people would choose a small family. Especially if they had confidence that the rules would be applied to rich and poor alike, and that cheaters would be punished. But if we don’t discuss it we’ll never find out if I am right or wrong. We’ll just blindly go off the cliff. The fact that we do not discuss the only thing that might actually improve the future is amazing. I concluded several years ago that denial must be genetic. I later found a theory for evolved denial by Ajit Varki and Danny Brower and it is the reason this site exists. 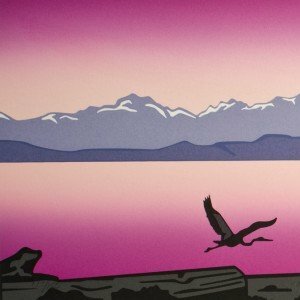 Today, Alice Friedemann of the Energy Skeptic blog published a paper addressing this issue by Roy Beck & Leon Kolankiewicz titled “The Environmental Movement’s Retreat from Advocating U. S. Population Stabilization (1970-1998): A First Draft of History“. It’s a long rambling paper on an important topic so I thought it worthwhile to summarize its key points here. Note that the paper has a U.S. focus with little analysis of what happened in other areas of the world. What changed from 1970 to 2000? In 1970 the need for population control was broadly understood and accepted by political leaders, business leaders, environmental organizations, universities, and the public. Strong environmental laws were passed. Earth Day had population control as a priority. Thirty years later in 2000 the problems caused by population growth were still discussed but there was no discussion of the underlying population growth problem. The US population had increased by 70 million (33%) since 1970 . There was more nitrogen oxide pollution, more CO2, more endangered species, and fewer wetlands. Environmental groups no longer had population control as a priority and did not oppose laws that increased immigration. Earth Day did not mention population control. What caused these changes from 1970 to 2000? In 1970 the fertility rate of the white population fell below replacement level. All population growth after 1970 came from immigration and higher birth rates of the non-white population. Environmental groups backed away from population control as a priority for fear of membership and donation loss due to potential charges of racism and the increased demographic influence of immigrants. Environmental groups competing for members and donations focused on issues that could demonstrate short-term successes rather than issues like population control that take decades to show results. It is much harder to raise funds for preventing future problems than for fixing an existing problem. In summary, protection of environmental institutions took precedence over protection of the environment. Business used donations (or the lack thereof) to influence environmental groups to drop population control as a priority because they wanted the economic growth created by immigration and reduced labor costs from an expanding labor pool. Politicians did not want to touch the population issue because of the increased voting power of immigrants. The Catholic Church aggressively opposed any group in favor of population control, especially after abortion was legalized. It appears the Catholic Church had a large influence on government population policies but historians need to research this to confirm. Women’s issues emerged as a priority which shifted the narrative from racially sensitive population control to politically correct empowerment of women. A view emerged within the left that most environmental problems were caused by unfair distribution of resources and capitalism rather than overpopulation. Priorities shifted from population control to changing the economic system. A view emerged that it was wrong to block immigration and to conserve resources for future generations while poor people struggled in developing countries. I found the paper to be a disappointment. I think it did a good job of explaining why environmental groups dropped population control as a priority. In summary they chose to give higher priority to protecting themselves than the environment. That’s no surprise. A much more important issue that was not addressed was why did the majority of the public drop population control as a priority? Given that public sentiment shifted it is no wonder that political leaders, business leaders, universities, and environmental groups followed suit. What really happened? I have a theory. In 1970 economic growth was strong. The middle class was healthy and not threatened. Most white families, for whatever reason, had already decided to have 2 or fewer children. Making population control a priority did not require lifestyle changes for most. There was surplus wealth to spend on environmental protection laws and enforcement. People who understood the threat of overpopulation could form organizations and raise funds to support themselves. By 2000, economic growth had slowed. The middle class was in decline and feeling threatened. Recent immigrants with higher birthrates became a powerful political force and resisted changes to their lifestyles or immigration reductions. Environmental groups chose survival over principles. Government deficits had replaced surpluses. Economic growth was becoming harder to achieve due to depletion of low-cost non-renewable energy. Our monetary system requires growth or else it collapses, however it will not collapse if per capita economic activity decreases as long as total economic activity increases. Therefore continued growth of the population via immigration became necessary to maintain some overall economic growth despite falling real incomes for individuals. Today, 15 years later, the middle class is under even more pressure because low-cost non-renewable energy continues to deplete and globalization has eroded their standard of living. They see that immigration has not benefited them, seek someone to blame, and many have decided to vote for Trump. If I am right, it is ironic that economic growth slowed due to the overpopulation related depletion of non-renewable resources which then required a further population increase to maintain some economic growth to avoid collapse. It’s analogous to the positive feedback loop of rising temperatures causing ice loss and methane release. We have only two paths. We can find a way to break through our evolved denial and proactively act. Or we can let nature act for us. In addition to the factors already outlined in the article as reasons for the disappearance of population control from the public’s priorities, we’ve also had the dropping of China’s ‘one child per family’ policy in 2015, which took effect at the beginning of this year. Although it’s possible that the growth of China’s population which results may not be very significant (largely because of the economic and social incentives that have indirectly arisen from the rapid urbanization of China), the relaxation of the one-child policy sends an unwelcome signal around the world that as a species, we need not worry about constraining the total size of the world’s population. But it’s an unfortunate fact that our global economic system, which in the West is largely based on industrial capitalism, has trapped us in a vortex in which that system is only viable if each successive generation produces additional consumers, despite the wastefulness of such an economy and the associated depletion of resources and degradation of the planet as a habitable place. In such a situation, a good understanding of the demographic and economic realities attached to the various possible future scenarios, far-sighted vision, assertive leadership, a supporting legal framework, and adequate financial and administrative resources are all necessary for effective action that is capable of combating the undesirable trends and consequences connected with uncontrolled population growth. Unfortunately, in the notionally democratic societies of the West, perverse incentives actively encourage politicians to pander to their support base and not raise the issue of curbing population growth via enforcement of an as-yet non-existent limit on fertility (something the Chinese did through both physical coercion and fiscal penalties), and not to draw attention to the adverse economic consequences of limiting population size. So as this article’s author has already made amply clear, nothing useful is happening on the political and social debate front regarding this issue. Given this situation, the only recourse I can envisage that seems remotely possible to achieve by voluntary means is for a few foolhardy national leaders to set up and fund a dedicated policy-making unit under the auspices of the United Nations, the British Commonwealth, or the Non-Aligned Movement; this unit would have the aim of drafting an international convention having legal force and laying out proposals for concrete population control measures which the signatory nations could be induced to adopt. This would then be followed by the multilateral adoption and ratification of a suitable version of the draft by an overwhelming number of countries; the establishment of monitoring and enforcement mechanisms; and the creation of an international legal framework to coordinate and adjudicate the implementation of the population policy. No, on second thoughts this is impossible to make happen. Bottom line: we’re all screwed and the planet is doomed. It’s quite remarkable that no leaders anywhere in the world, even those nearing the end of their term, speak out on population reduction. Some really powerful force must be at play because it is obvious to anyone that looks that we are in severe overshoot. I think it’s evolved denial, but if it’s something else I love to know what it is. The denial is likely rooted in the fact that nature was originally much “bigger” than people, and something to rightly fear. For centuries we lacked the technology (and/or numbers) to do it much harm. Now, most people still behave in the same old ways on a reptilian level, but they ignore modern context or assume “THEY” will find some technological fix for the whole mess. Anyone with their eyes open should see that those fixes are usually weak attempts to mop up the mess. Nothing really gets better except for random sanctuaries preserved amid growing destruction. Not enough people care to see what’s really going on, which I’d call a mass failure of intelligence. A guy like Trump doesn’t get elected by a species that really understands cause & effect. It’s not just random dummies. The wind power industry is a good example of how people don’t think critically and deny what’s right in front of them. “Clean” energy is destroying much of the world’s remaining scenery and killing off birds & bats while posing as planet-friendly. For me, that was the last straw in thinking Man would do the right thing by nature. I have met maybe five people in my life that know that this is a serious problem. Because of this I know there is absolutely no hope that anything can be done to save civilization as we know it from crashing hard. Luckily I don’t care because I am old and I was smart enough even when I was young not to have any children that I would have to feel guilty about and therefore have reason for denial. Hi, welcome. It’s amazing how we never discuss the things that matter. A couple people are killed by a lunatic in London and it’s front page news. Millions are at risk from over-population related famine and we ignore it. Good article. I think far more “deep green” people understand overpopulation than you assume, though. They just need to mention it more, if they aren’t. We’re close to the end of the present large cycle now – we’ll crash & burn economically and this will likely lead to nuclear war and voila! you have your massive population decrease. Problem solved. Then we start over. Perhaps the bigger question(s) should be.. why these cycles? That might mean a look at spirituality and the meaning of life. From my brief scan of this (very interesting) site, I think the author prefers not to go down that rabbit hole – or more accurately, has already dismissed any possibility of anything spiritual. I am very interested in understanding the genetic reasons for spirituality. Thanks for your reply and link that I hadn’t previously spotted. Nice Alien/Religion story! For the most part, I agree. However, I spoke of spirituality, not religion. It would appear you haven’t had yours and sadly, science won’t get you there.. yet. Einstein came very close and though I have an extremely limited understanding of current quantum physics, aren’t scientists now (somewhat reluctantly) coming to the conclusion that beyond physical matter is something elusive, something beyond science, yet to be identified? One day, the light bulb will go on and there’ll be that ‘Aha’ moment… it’s SPIRIT!! I’m a material guy. The closest I come to spirituality is having a deep appreciation for how rare and special it is for us to be having this conversation, and how sad it is that we are screwing it up. Ah well, each to his own…. agree with the other sentiments and enjoy reading an alternative and well thought through pov. Actually, we should be grateful to be part of an unlimited, ever expanding and infinite Universe in which the only limitations are those we place on ourselves. Everything is possible and we are given freedom to choose in every moment (where actions can only take place). Every act has its consequence and those consequences unfold as our present circumstances (on a personal, national and world level). And so the wheel turns until we ‘get’ it… There are no accidents in the Universe and everything is Perfect… yep, big call, that! But hey, that’s just my pov! “Much ado about nothing” is the same mindless attitude that led to the problem in the first place! Define “nothing” for us. Are you so jaded that you see this as would an alien looking down from a spacecraft? “Problem solved” is nonsense, since all the chemicals and industrial detritus Man creates won’t just disappear. A relatively recent example is the huge mass of ugly wind turbines being touted as green while the countryside gets ruined, in addition to all the scars from mining, drilling, agriculture, ranching, etc. (see http://cutt.us/blight_for_naught). The obvious problem is quality of life for numerous species right now, tomorrow and in coming decades. Glib observations of historical crash cycles are useless to anyone with a conscience. That comment is also devoid of context. Global warming deniers casually talk about “natural cycles” that repeat themselves, while ignoring the context of this current, unnatural one. Overpopulation on a global scale is not a natural cycle and it’s also driving CO2, along with aspirations to affluence in Asia, etc. The course of human progress (if you want to call it that) has not repeated over eons, so why lump it in with ancient cycles? We could become a one-time circus in the history of the Earth if intelligence doesn’t prevail over greed and fatalism. There have been localized civilization collapses, e.g. Rome and the Mayans, but it’s now a global issue since so many economies are interdependent (biggest weakness of globalism). The assumption of endlessly affordable oil for ocean and air freight is naive, but feed-the-world groups keep framing hunger as a “distribution” problem rather than overpopulation and violations of local carrying capacity. Nobody makes such excuses when other species die off during local droughts or plagues. Man just delays the final outcome with technologies that can’t exist on a practical scale without finite fossil fuels, including the “renewables” sector. The feel-good cry of “100% renewable energy” fails basic math and is another facet of overpopulation-denial (see critiques of the 2009 Jacobson/Stanford report). It’s ironic – sadly ironic – that subscribers to this ‘un-denial’ site seem to be ….. in a state of denial. Denial of the truth of their existence. That truth (I know you want to know) is that we are spiritual beings having a human experience. You are not your body – gasp! You are much, much more – double gasp!! This irony, this ignorance, is widespread in the Yali Yuga in which we find ourselves, the Iron Age, the age of no reason.. we’re not here in error or some mistake and the chaos will continue unabated; it’s actually just begun. So I agree with you guys in many respects. I.e. that we’re heading for the crapper at warp speed. It’s just that your premise is wrong. The problems are not ‘out there’, they’re right here, within each of us. If there is blame to apportion try past actions resulting in present circumstances. Try ‘mindfulness’ not pointless & mindless whining & denying. If it’s any consolation, it’s all perfect and just as it should be. No accidents in the Universe! Thanks for this Rob Mielcarski. Very well done. I think your points about getting politicians involved are well thought out. The short term nature of the election cycle means the benefits just don’t come close to the costs, except if the whole community is on board. And that seems unlikely. Although one of the key issues with both the unexpected Brexit and Trump victories was unhappiness in the community with high immigration. I’d love to hear your thoughts regarding the possibility of working with the people who have gigantic chunks of money invested in oil, coal, natural gas and other investments that won’t reap benefits for many years. I wouldn’t think that they have the same short term view. I’m reading Niall Ferguson’s Biography of the Rothschild’s. The urban legend is that they were just all about business and covered every angle all over Europe. The second part, though, was that they were actively involved in trying to keep the peace in Europe because they made more money when industry was booming rather than when money was spent on soldiers and guns. They also knew that when war breaks out all the stock markets dive and their investments lose value. I wonder if the big money people today have the same concerns. Are they happy with the flood of refugees into Europe? Do they see any reason that the flood would subside? Are they worried about conflict when refugees are forced on one country (like has happened in Turkey and Italy) and the other countries are not paying their fair share to help solve the problem? Are they concerned with worn out infrastructure that isn’t being replaced because rapid population increase, constantly requires new infrastructure? Is there any way to convince these big money people that they stand to make more money with less risk, with a slower population growth rather than concentrating on pollution, climate change, extinctions and congestion in the cities. Taking the example of the Rothschilds they could work behind the scenes unlike politicians. In Australia, the Business Council of Australia is actively in favour of increased population because they see it as a way to keep wages down with greater competition for jobs and they make more money with more customers. The problems are not as critical as they are in Africa, Europe and South Asia. I wonder what the big multinationals think. Any ideas? A note for Erik Kowal the one child Policy is now a two child policy so it isn’t like they have opened the flood gates. Controls are still more strict than anywhere else in the world. I was not aware that China has kept a two child policy in place. I will have to do some more reading. I do not know the answer to your interesting questions. My guess is that big money would put keeping some economic growth going at the top of their priority list. If and when economic growth stops the system will collapse via deflation, if leaders choose a hands off approach, or via hyperinflation, if leaders choose to fight reality with money printing. Big money stands to lose the most because most wealth is in the form of debt which will lose most of its value in a collapse. In an environment with high debt levels and falling net energy it is very difficult to keep growth going. We’ve done it so far by expanding debt much faster than GDP. Some countries have also chosen to import poor people. The design of our economic system does not care if there is per capita growth, it only cares about gross growth. By increasing the population you can keep some gross growth going a little longer, even while per capita wealth declines. Of course there is no free lunch, and this strategy will increase the level of suffering experienced when the inevitable collapse occurs. Not sure we will get a sudden collapse. I don’t have anything to back that up except that the Global financial crisis was weathered through borrowing and printing money and we are so relatively rich now that fluctuations in the system don’t cause people to starve, we just have to put off buying a big screen TV or going to Hawaii. I’m more inclined to believe we will see a gradual erosion of living standards that in some respects won’t be noticed by the average citizen. I live in Sydney and grew up in Los Angeles. The time to get to work is horrendous compared to 25 years ago but everybody just accepts it. We’ve got smart phones now so the time goes faster. The price of food, energy and housing has increased faster than wages over the past 20 years but we’ve got the internet and cable TV so its all okay. To respect silence: wind turbines don’t kill even close to 0.1% of all the birds killed by man-made conveniences. That’s a tidy but misleading claim that gets trotted out all the time. It doesn’t mention the TYPES of species, including migratory birds far from cities, and plenty of raptors that can’t be killed by the house-cat platitude. Quasi-environmentalists read stuff like that and casually claim it can be fixed by future gizmos, or turning turbines off at certain hours (yeah, they’ll surely lose all that revenue to save bats). They skip over the core problem of obnoxiously large machines right in the middle of flyways, with MANY more planned. What you see marring today’s landscapes could be only 1/10th of what’s in store. It’s not a case-closed situation! I can’t fathom how “environmentalists” can applaud towering construction projects and claim no harm is being done aesthetically or in terms of wildlife. It defies all logic. Noise is another big topic, laden with denials and accusations of NIMBYism. The wind mob is much like climate-deniers in that it cherry-picks one issue at a time (dishonestly) and fails to account for all the cumulative harm. I think your point regarding raptors not being killed by domestic and feral cats is a good point. It is clear that the Altamont wind farm was located in an area that was dangerous for those species. Similarly by estimating the total number of birds it is clear that feral cats are killing significant percentage of pigeons and other nuisance species that are not critical to the remaining natural ecosystems that we are trying to protect. At the same time raptors are not the only valuable bird species on the planet. Cats kill lots of parrots and other valuable smaller birds so the total numbers are important. Even with the Dr Shawn Smallwood estimates, which are at the top end of all other estimates, the total birds killed by wind turbines are tiny compared to all other man made features. I understand you think that Wind farms are a blight on the landscape and many people share this opinion. I know of people who would rather have a nuclear power plant on every corner and a 5 degree increase in the global temperature rather than look at one more wind turbine. I just don’t share that opinion and I assume that we are looking at the same photos and same videos, so it’s not a matter of not enough information. I know the Noise arguments and have seen some of the data and don’t find it compelling. In most of the cases I’ve seen, the impacts due to noise are subjective. Certainly the noise from turbines is very low compared to traffic and industry. The last argument on the website you referenced ( http://cutt.us/blight_for_naught ) seems to be that wind power really doesn’t reduce greenhouse impacts or fossil fuel use. Reading some of your comments I guess you don’t even believe that one. Consider the rushing noise from a standard house fan and ask yourself how machines EXPONENTIALLY LARGER could not affect people and animals in a wide area. Driven by the wind itself or driven by motors, blades cutting through air will make friction noise, along with machine bearings and gears. Many wind turbines sweep over an ACRE of airspace vs. a square foot for a typical fan. Where a turbine ends up sounding loudest depends on topographical acoustics. Right beneath one is often the quietest place because it propagates outward. Smug “I can’t hear anything, case closed!” recordings are typically made in those spots. A certain mindset makes people say wind turbines are “beautiful” A) because they’re assumed to be anti fossil fuels (ERoI denial) and B) because their form looks more “elegant” than a blocky coal or nuclear plant. Both of those are based on acquired tastes or outright lies, considering the number of wind towers in existence today. They turn former natural or farm landscapes into industrial parks, like it or not. I could compare the white curves of a nuclear plant to an attractive woman but I have no need to lie about Man’s total impact on nature. The wind power crowd is in denial and must know it on some level. Replace those white towers with much smaller, less visible oil rigs and wind-puppets would be screaming to dismantle them. They rationalize away obvious blight on mere technicalities. Another good example is the 2013 dispute over LG’s proposed 143-foot office building on the Hudson River, which they cut by half to preserve the famous treeline. 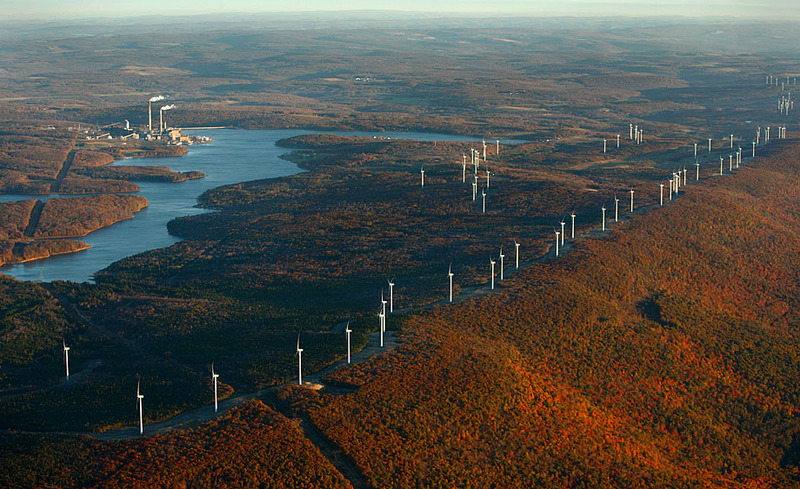 Meanwhile, 400-650 foot wind turbines tower over trees in scenic places that aren’t as famous as the Hudson. It’s a bit like the outcry when Cecil the lion was shot vs. thousands of no-name lions who’ve died in similar ways. With wind power, the death of scenery, birds & bats is ongoing and willfully ignored by quasi-green shills. It’s also a fallacy to imply that nuclear plants would be “on every corner” since they have far greater energy-density than wind turbines, which often sprawl over 30,000+ acres or a dozen miles of ridges for just a few hundred. Here’s a photo of a coal plant (I’m not “pro coal”) that puts out far more power than sprawling wind turbines nearby. https://bc7ef94c9aa3a4d0c3bb-524159c56cd80a90fd1e155cf4179a97.ssl.cf1.rackcdn.com/wv_cnvy1604.jpg (Mt. Storm, WV). Nuclear is similar in its land-to-power ratio, with significantly smaller mined areas supporting it. I can’t see integrity in those who decry coal mountaintop removal yet claim spiky clearcut ridges are “beautiful.” In nature, you do see bare (alpine or desert) rock but never such alien structures. Many coal mines, e.g. Wyoming are low-lying and hard to see until you’re right on them. Wind turbines are far more visible now. If you’re truly OK with the current visual impact, you have to realize that, for any major effect on fossil fuel use (still unlikely to minimize AGW) we’d need many times the number of turbines seen today. The widely quoted 2009 Jacobson scheme seeks 3.8 million large models. Putting them offshore just shifts the blight to our last “infinite” horizons, which I consider a crime against nature. It’s very rare to have offshore wind turbines hidden from land, and they’re the tallest models at 700+ feet now. They even want them to be over 1,000 feet tall for grandiose “palm tree” turbine technologies: https://energy.gov/articles/enormous-blades-offshore-energy (could those ever be worth all the fuel burned to build them?). Even the mere five turbines at America’s first offshore project at Block Island, RI have rankled some residents. The windsters respond with hollow classism arguments, as if only rich people care about a view! They sound like right-wingers chiding fractivists. Respect Silence I don’t think this will make any difference to you but in case there are other readers. • It’s all a big conspiracy against my point of view by very evil people and this person has just been caught up in the conspiracy and believes it. If you don’t have any respect for the person you are trying to convince, you are unlikely to get any respect in return, and they are, therefore, unlikely to be receptive to your ideas. A quick google search of birds killed by wind turbines has several articles all saying that the numbers of birds killed by other man-made sources is thousands of times larger than wind turbines. Wikipedia shows a list where other sources, not including cats, are at least a thousand times larger than wind turbines. Perhaps there are other elements to the story that I am not seeing, but that is how I’ve come to my opinion. I could not find any quick answer on the percentage of bats killed by wind turbines except that the number is substantial, white nose syndrome kills a huge number of bats and farmers kill lots of bats. Perhaps there are other elements to the story that I am not seeing, but that is how I’ve come to my opinion. Sorry, but I have no interest in getting along with people who call themselves green while promoting obscene intrusions on already-stressed landscapes. This doesn’t need to be explained those who intrinsically get it. Famous environmentalists with a land ethic (Muir, Leopold, Abbey, et al) are highly unlikely to have supported what wind power has become. Many photographers resent that so much scenery has been lost, though some have become industry shills with photos of silent, hazy sculptures, always in the distance. Again, this is what your beloved wind farms look like in the real world: http://google.com/search?tbm=isch&q=wind+farm+mountains Videos show it best because they’re also spinning (part of the time), adding to their unnatural impact. People who respect open space can’t just look away or prattle on about “careful siting” when each new project is already contested. You folks keep sidestepping the severe bat-kill problem, so here again are the links you claim to be unable to find: https://www.usgs.gov/news/a-deadly-double-punch-together-turbines-and-disease-jeopardize-endangered-bats and https://www.scientificamerican.com/article/bat-killings-by-wind-energy-turbines-continue/ You’ll keep repeating the same industry-sourced bird studies, so that’s a stalemate. To me, wind power defenders are simply lying about what’s really going on, just as climate-deniers lie about CO2 risks. You’re stuck on anthropocentric gestures toward solving climate change instead of questioning growthism or “sustainability” that requires no real sacrifice. Unless I’m mistaken, the main reason for this un-denial blog is because of those very attitudes! Wind energy is the opposite of where technology should be heading; big, noisy and clunky vs. small, quiet and agile. Industrial wind blight created a tipping point among people who realized Man may never do the right thing by nature. Even if noise/birds/bats weren’t issues, spoiling nature’s majestic physical legacy to “save the planet” is crass and futile. It’s a gut reaction, like watching vandals white-tagging the Great Pyramids or trophy hunters turning elephants red. You don’t just accept it as normal. Per unit, solar PV is a weaker power source than wind but it has the big advantage of placement on things that are already built (sprawling solar projects like the Ivanpah bird-fryer are mistakes). Solar PV and rooftop solar thermal systems should be greatly scaled-up to cover what wind is trying to supply. Deep geothermal should also do the same. Tidal energy is too intrusive on a bigger scale and should never be built in non-industrial areas. Nuclear is a tricky topic but I’d still rather see it than more wind turbines. Enough said here. Wind power is indeed no viable strategy to reduce CO2 emissions. Wind, solar make up only a marginal share of energy production (1%, 2% ? ), and as long as we have economic growth we’ll have growing CO2 emissions. They can’t replace fossil fuels more than to a small degree so we’ll end up burning fossils as long as economic activity continues. The only way to reduce CO2 emissions is by shrinking the economy. We’ll get there when fossils peak or the economy crashes…. So the effect of renewables is really just a psychological one. Of course we’ll also continue majorly wrecking the environment one way or the other, until we’re back to much lower population levels and subsistence living. Population control is an orphan cause, as no one faction’s short-term self interest is furthered by espousing it. And the most powerful self-interest that drives growth is some form of greed. It’s obvious why corporate oligarchies promote pop growth – a bigger customer base to increase demand for goods and services, and bloated labor pools to drive down wages. A one-two punch that powerfully amplifies profits. But there’s also anthropocentric biologic greed, the selfish gene. This leads to zombie-like procreation behavior by the billions of people inhabiting the earth, people from every socioeconomic stratum. Logically, if couples just wanted the satisfaction and psychological rewards of raising a family they could just adopt one or more of the millions of impoverished and starving children already on the planet, but that is rarely their first choice, thanks to their innate biologic drive to promulgate their own DNA, not that of another “tribe” from half way around the world. Other factions like organized religions, special-interest groups, politicians, and countless others also have greed-related motives for promoting growth. So, unless you expect to sell a few books (don’t expect to get on the best-seller list) about the subject, you almost have to be a perfectly altruistic saint to promote population control. Because in doing so, you would immediately be targeted as a racist, anti-family demagogue. On top of that, no benefits of pop control can come quickly and surely to you personally, only to the world at large over many years’ time. Human nature being what it is, how many people would want to take on a cause like that? Population will be reducing soon. If people weren’t in denial about how this is going to happen I think they’d be happy and grateful to have only 1 child. Next Next post: Why is my message so unpopular?